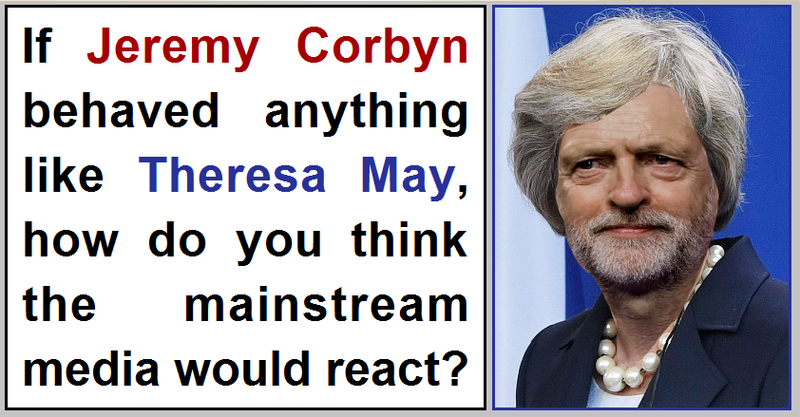 How would the press react if Jeremy Corbyn behaved anything like Theresa May? The extreme levels of mainstream media bias against Jeremy Corbyn has been academically proven. Even if you're the kind of person who has "had enough of experts", consider these things. Given that the mainstream media continually blamed Jeremy Corbyn for Brexit (123 media appearances), how is it possible to explain that Theresa May actually gets repeatedly praised for her lazy self-serving non-campaign during the EU referendum (just 29 media appearances despite holding one of the most important offices of state)? If Jeremy Corbyn had openly bragged about his willingness to incinerate 100,000 innocent men, women and children in a nuclear fireball like Theresa May did in July 2016, would the mainstream press have painted him as a "strong leader", or would they have used it as evidence that he's some kind of genocidal left-wing tyrant? If Jeremy Corbyn had actually quoted a bigoted and misogynistic Twitter troll in parliament like Theresa May did in September 2016, would the mainstream press have given him a total free-pass on it like they gave Theresa May? If, like Theresa May, Jeremy Corbyn had a proven track record of attacking the rights and liberties of the British people, undermining the justice system, introducing discriminatory laws and fantasising about scrapping our human rights and replacing them with a set of "allowances" drawn up by him and his mates, would the media continually portray him as a "safe pair of hands" or would they use such an appalling track record as evidence that he's an authoritarian tyrant? If Jeremy Corbyn decided to sign off on a ludicrous rip-off deal to bribe communist China into building our energy infrastructure for us like Theresa May did, would the mainstream media have just let it pass, or would they have shrieked themselves into hysteria about his extreme-left tendencies? The obvious answer to all of these questions is that the media would not have given Corbyn the same kind of ridiculously easy ride that they keep giving Theresa May. The mainstream press prefer Theresa may because she's keen on tax cuts for corporations and the super-rich, which suits the billionaire sociopaths who own most of the newspapers that set the political agenda. 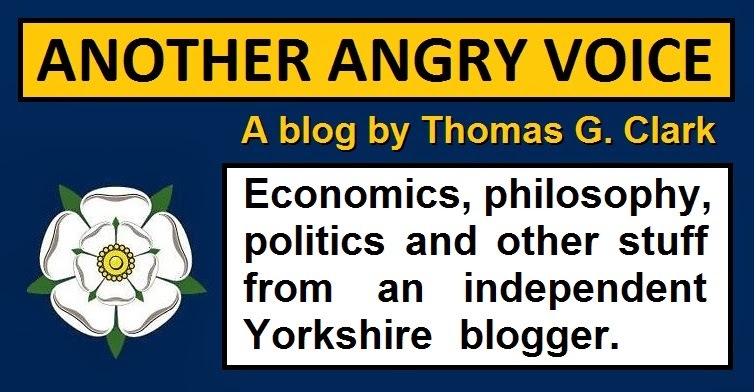 They hate Corbyn because he's a genuine anti-establishment outsider who would shake up the political system by giving more power to ordinary people (meaning less for self-entitled politicians, billionaire press barons and lazy mainstream media hacks).